Hannah got her wish granted! 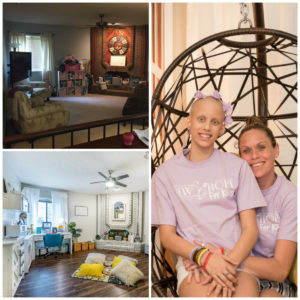 Designers and volunteers who’ve been working on the room while Hannah was in the hospital revealed the finished makeover to her. “They’ve just made me smile so much – probably more than I’ve smiled in a long time – because cancer brings you down but they lift you up,” said Hannah. “The smile – any chance you get to see your child smile is amazing when you’re going through this journey. To watch her sit around with her friends in a room and be proud, and not think about cancer for a few minutes is a blessing.” ” said Elizabeth, Hannah’s mother.